Side note: Feel free to double the dressing. Along with adding other ingredients to the salad. 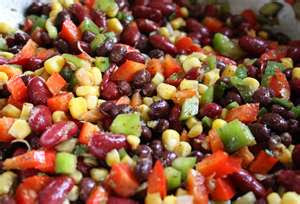 - In a large bowl, mix beans, onion, red pepper and corn. - In a separate small bowl, whisk together vinegar, sugar, olive oil and spices. - Add the dressing to the beans, and toss to coat. - Once beans are coated with dressing, chill beans in the refrigerator. Salad should chill for several hours. Chilling the salad for a longer period of time allows the beans to soak up the flavor. I swear I saw your post here for your cookies and some how my comment got posted to your Bean salad which looks wonderful. It must had been on YouTube or Twitter that I saw it,, U truly are creative!! hehehehe! No worries at all! :) I appreciate every comment. ♥ Thank you for the sweet compliments. I actually have never tried Bob's shortbread cookie mix. I bet it's delicious! And, I'm sure it would make lovely cookies!